1. 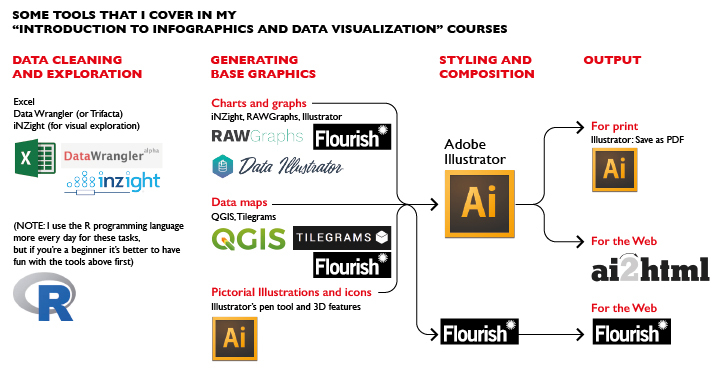 I generate base graphics in programs such as Flourish, iNZight, RAWgraphs, Data Illustrator, QGIS, etc. 2. I export these as vector files, open them up in Illustrator, style them, and arrange the final compositions there. 3. Finally, I use ai2html to export the Illustrator file if I'm going to show it online. If it's a print project, I save it as a PDF. 4. If I use Flourish and the output is an interactive graphic, I do the styling and exporting in it. The list below includes videos that I share with my students during the first few weeks of classes in our Journalism and Interactive Media programs at the University of Miami. The videos I've recorded myself are in DropBox folders and they are not compressed. Why? Because I'm giving you permission to use them at will in your own classes. You decide whether to compress them for your own purposes or not. I recommend not to play these DropBox videos in your browser, but to download them first to your computer. Then, if you have trouble opening them, try a player like VLC, which is safe and free. All videos and data are inside this folder. To read about the techniques I explain in them, read The Truthful Art, chapters 5-9. Data Wrangler is an old but very simple tool that lets you transform data in wide format into long (or “tidy”) format. INZight is a powerful and easy to use free tool for data discovery. NOTE: If you want to learn more about Illustrator, consider purchasing my 12-hour tutorial. This tutorial is by Data Illustrator's co-creator John Thompson. Data Illustrator is a tool that greatly expands on the charting capabilities of tools such as Adobe Illustrator. All videos and data are in this folder. Flourish is a tool to design both interactive and static data visualizations. It's quickly becoming one of my favorites. All the videos and data are inside this folder. Raw is a wonderful tool that lets you create graphs and charts that you can later style in Illustrator or InkScape. All the videos and data are inside this folder. After designing your charts with INZight or Raw, you should change their style to make them more elegant. Adobe Illustrator can help with that. This tutorial is by Luís Melgar.